Stephen Pevar SAIGE (Society of American Indian Government Employees) conference. racial Stephen Pevar is a graduate of Princeton University (1968) and the University of Virginia School of Law (1971). 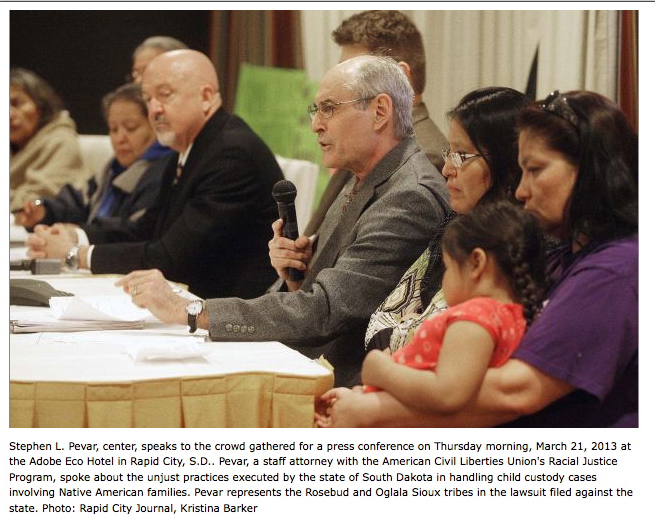 From 1971 through 1974, Mr. Pevar was a staff attorney with South Dakota Legal Services on the Rosebud Sioux Indian Reservation. From 1976 to the present, he has been a National Staff Counsel for the American Civil Liberties Union. Mr. Pevar has litigated some 200 federal cases involving constitutional rights, including cases in more than ten different Federal District Courts, three different U.S. Courts of Appeals, and one case in the U.S. Supreme Court. The areas of his specialty include free speech, Indian rights, racial justice, prisoners’ rights, and the separation of church and state. 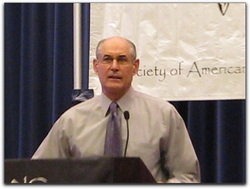 In addition to his work with the ACLU, Mr. Pevar was an Adjunct Professor at the University of Denver School of Law, where he taught Federal Indian Law from 1983 through 1999. He is the author of The Rights of Indians and Tribes, Oxford University Press, published January 2012). He has litigated a number of cases in the field of Indian rights and has lectured extensively on the subject. He is currently teaching Indian Law at New York University.